This is the site of the 1813 battle where more than 400 settlers, many of mixed Creek heritage, fell in an attack by warring Redstick Creek Indians. This marks the outbreak of the Creek War of 1813-14, a phase of the War of 1812. A log stockade, a replica of an 1800's blockhouse, and a split rail fence provide visitors an opportunity to look back in time. 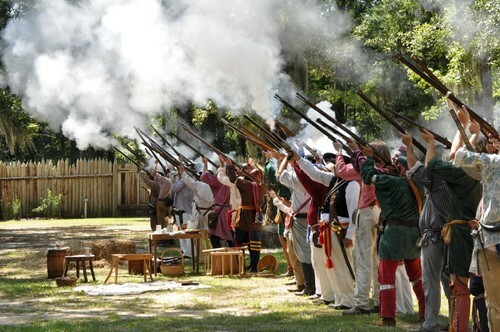 An annual reenactment is held the last weekend in August. Visit the website for more information. http://preserveala.org/fortmims.aspx?sm=g_f and also http://fortmims.org. The Fort Mims Restoration Association operates the site. Hwy 59N then W on CR 80 -3miles. Near Boatyard Lake - Right on Fort Mims Rd.